Next week, I’m playing an overlapped, simultaneous concert with Francesco Tristano, this time at Le Poisson Rouge in New York. It’s billed as “[ Simultaneo ].” In the advertising it says: “Two concerts at the same time!” A manifestation of remix culture for sure — it’s Girl Talk Classical! 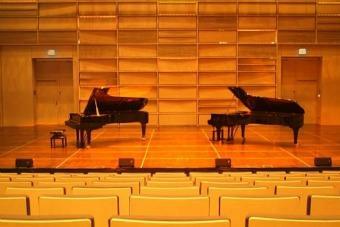 In Echternach in 2009, we did an overlapped performance, a continuous 70 minutes of sound made with two pianos. Glass’s music was overlaid with Carl Craig. Stravinsky peeked through Chopin. We played music by Bussotti and Buxtehude and J. S. Bach. The whole show was somewhat knitted together with Earle Brown’s Twenty-Five Pages. (We started with Brown’s music and kept going back to it.) I treated pages of Brown’s score like photographic slides, leaving each one in view for whatever amount of time seemed right, continuing to play from the page while it was in my sight. Throughout the performance we were both on stage. We each played almost continuously. Two or three times we switched places at the two Steinways. In Echternach, the two or three audience members who left after just a few minutes probably were hearing cacophony. I was surprised by how almost every juxtaposition was transparent to my ear, allowing the musics to be heard. A certain focussing of attention (or abandon to the experience?) seemed to help. We rehearsed and listened during the two days before. Small accomodations and bendings were welcome. We didn’t set the order in which pieces would be played. One short piece got repeated. It wasn’t improvising, though there were many extemporaneous aspects to the performance. Several paintings are hung in one gallery. DJs combine tracks in remixing. Nightclubs have different music in different rooms and it may overlap, especially passing through a doorway. Then there’s that doorway into Don Giovanni’s party — there’s music “already in progress.” I. M. Pei’s entrance to the Louvre essentially erases the doors to the older structure. The world and our experience of it is so multiply-layered, polyvalent, hypertextual. A whole tradition of European art offered the sense of linear connection, development, and clear beginnings and endings. This simultaneous musical weaving is something else. At Poisson Rouge next week, there’s going to be one acoustic piano and one electric. We’ll be trading. Franceso is going to include at least two pieces from his new album Idiosynkrasia. And there will be electronic processing — all at the same time. That’s the awesomest, bizarrest, rockinest, coolest thing! Fantastic, creative thinking Bruce. Wish I could be at the Poisson to hear you. Break legs! Audiences can only grow for this. My 7-year-old daughter loves playing one Suzuki Book 1 song along with the recording of another. “Happy Farmer” + “Long, Long Ago” makes a good duet. Wish I could have been there. Hope you blog about this performance! I wish I could have been there…such an awesome concept. “Girl Talk Classical”? Sign me up! We heard this show at LPR and now I found your blog. It was a magic experience. I can’t even explain it. Hearing some recognizable music, some things that seemed to fit together in an uncanny way — how did you guys do that? — and other combinations that challenged thd limits of perception. It felt like being on the edge of some huge crater, glimpsing something unimaginable and hoping not to fall in. Or hoping to fall in. When the Messiaen piece came at the end, I was crying.